I volunteered to bring dessert to work’s fellowship night knowing full well that I wouldn’t have a bunch of time the night before to bake anything new or interesting. I decided that I would go the easy route and buy a brownie mix, make a pan of brownies, and be done with it. All well and good. However, in the spirit of not buying anything that I can make in my own kitchen, I decided to look up a recipe and see if I had the ingredients. I turned to my trusty allrecipes for some help and ran a search for “easy brownie recipe.” Score! All of the ingredients to make brownies were in my pantry, and so, I was out any excuse for going the boxed mix route. After all, that would involve a trip to the store and cash out of my wallet. Who do you think I am? Here’s the recipe I used, less the glaze. I doubled it to fill a 9×13 pan. 1. Melt 1 cup of butter in a saucepan over medium heat. Do NOT burn the butter. While it’s melting, lightly beat 4 eggs in a separate bowl. 2. Mix together 2 cups of white sugar, beaten eggs, melted butter, 1 tsp vanilla extract, 1 tsp almond extract (or just 2 tsp. vanilla, if you so choose). 3. 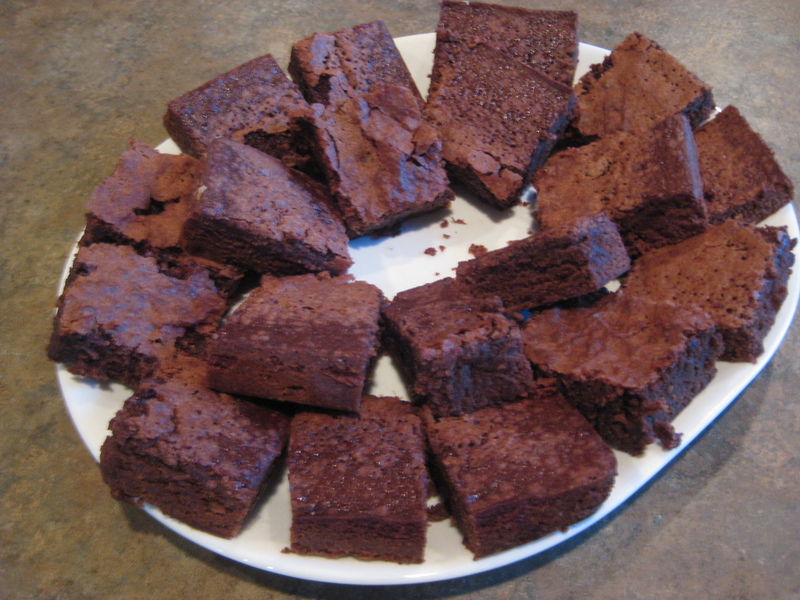 In a large bowl, mix 1 cup all purpose flour, 2/3 cup baking cocoa, 1/2 tsp salt, 1/2 tsp baking powder. 4. Mix wet ingredients with dry ingredients and valiantly attempt to avoid premature licking of the spoon. 5. Spray and flour your 9×13 pan and pour in the batter. You may now lick the spoon (which is, in my opinion, the best part). 6. Bake for 30ish minutes at 350 degrees. These brownies are light and cakey, full of chocolatey goodness. If you’re looking for a dense, fudge-esque dessert, this isn’t it. I kind of like it that way. Next time, I intend to swirl in some peanut butter. Or add chocolate chips. Or oreos. I wanna know: What sort of things do you like to add into your cookies, brownies, or bars? I’m a huge fan of adding peanut butter or chocolate chips or nuts. Super easy! I’m totally making this tonight to take to a friend’s house! Yay! They turned out super well 🙂 Easy to make…they’re tasty. Exactly what I love in a dessert. The addition of choice recently? Coconut. Because evidently it will take us an eternity to finish off the gi-normous bag in our cupboards. Coconut is great in muffins, cakes, frostings, oatmeal, yogurt, smoothies….